Justin St. Ours | Daily Press Carney-Nadeau’s Giselle Laurila (left) looks for an open teammate as North Central’s Jadie Linder (30) defends Saturday at Carney. 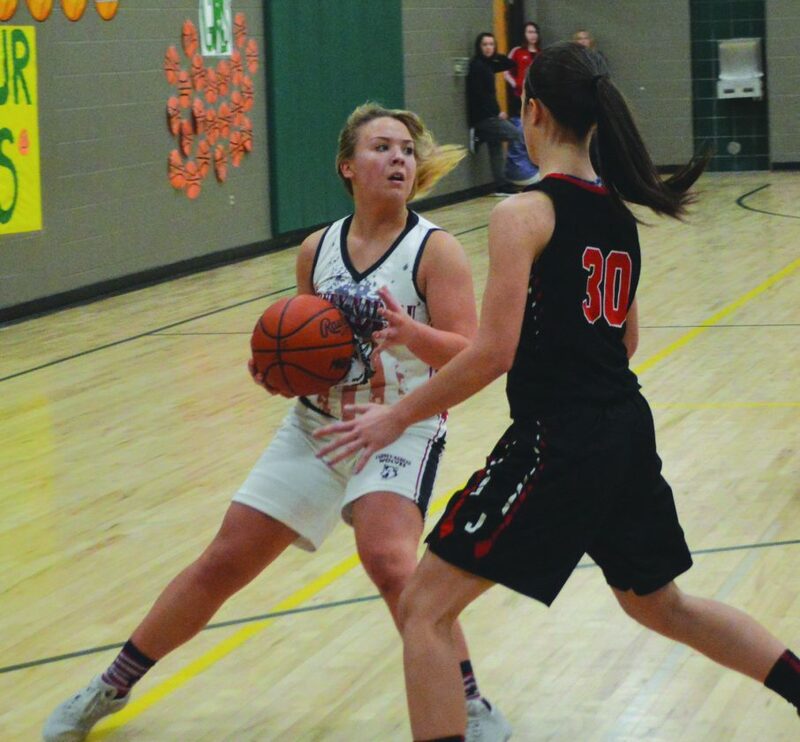 CARNEY — The Carney-Nadeau girls basketball team came from behind to overpower the North Central Jets 50-46 in a Skyline Central Conference game here Saturday. The Wolves were trailing 41-32 at the beginning of the fourth quarter, but their perseverance paid off when Tessa Wagner, who went 9-of-9 from the line, hit a free throw with 2:11 left to tie it up 45-45. The Jets encountered foul trouble soon after, with Carney racking up 10 free throw opportunities in the last minute and a half. North Central was unable to find the net except for a single free throw from Chloe Wells, who scored 10 points. The first quarter went back-and-forth, as the Wolves (8-3, 8-3 SC) showed their proficiency from the line, going 5-5. The frame ended with North Central leading 17-16. Layla Blahnik-Thoune scored in the first 30 seconds of the second quarter to put C-N back in front. The Wolves maintained their lead for the rest of the half and led 28-27 at halftime. Three minutes into the third quarter, Andie Arsenault hit back-to-back treys to put the Jets back in front 34-30. The Jets (8-4, 8-3 SC) outscored the Wolves 14-4 in the period. “We were more hesitant on shooting,” Wolves coach Kris Blahnik said. The Jets had trouble scoring in the fourth quarter, but still led 45-41 midway through. The turning point was the last three minutes, when the Wolves took advantage of the Jets’ foul trouble and iced the game from the charity stripe. Blahnik said confidence was the biggest key in the fourth quarter. Blahnik-Thoune led the Wolves with 20 points, while Wagner added 15. Arsenault led the Jets with 14 points and Jadie Linder chipped in with 10. Carney, who also won the jayvee game, travels to Stephenson today. North Central hosts North Dickinson today. North Central — A. Arsenault 14, Linder 10, Wells 10, B. Arsenault 5, Smith 3, Neville 2, Pavlat 2. FT: 10-19; F: 24; Fouled out: None; 3-point field goals: A. Arsenault 2, B. Arsenault 1, Linder 1. Carney-Nadeau — Blahnik-Thoune 20, Wagner 15, Poupore 9, Boulton 4, Charlier 2. FT: 18-29; F: 19; Fouled out: Thoune; 3-point field goals: Poupore 1, Blahnik-Thoune 1.